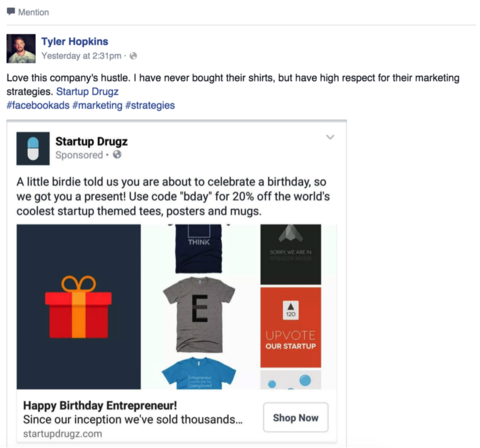 Running a successful Facebook ad involves dozens of variables. Of these variables, personalization is one of the most important. Your ad needs to speak to the person viewing it, which creates a dilemma for the advertiser. You want to create an ad that reaches a large number of people, however the larger your reach, the more general and impersonal the ad. This is why retargeting and dynamic product ads have become so incredibly popular. You can reach large numbers of people with incredibly personalized and relevant ads. Retargeting and dynamic product ads are great when it comes to displaying highly personalized ads to people who have already visited your site. But what about the 99.9% of people who have never heard of your brand? How do you create a personalized ad that truly speaks to someone who has never visited your site before? This is where you need to get creative with Facebook’s detailed targeting options. 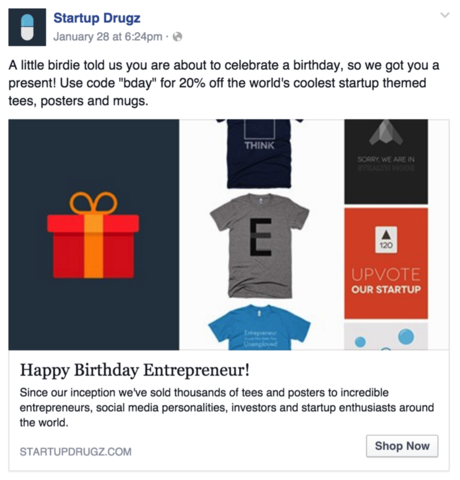 The one we have used at Startup Drugz with incredible success is the “upcoming birthday” targeting option. The results we have seen with this campaign have been incredible. So far the ROI is an astounding 2,700%! Beyond the ROI, we have received more positive feedback from the new customers we gained due to this ad than any ad we’ve ever run (see mention below). The beauty of this ad is that it uses a targeting option that is dynamic, so the ad’s audience is updated everyday. This helps eliminate ad fatigue by ensuring the frequency never gets too high. – Friends of Upcoming Birthday: This is almost identical to the targeting we use except instead of the ad viewer being the one with the birthday, they have a friend with an upcoming birthday. This targeting option would be a great way to promote your product as an awesome gift idea. – Newly Engaged: This option allows you to target Facebook users who just got engaged. If you run a company that sells anything in the wedding space, such as dresses, event space or offer registries, you should be using this targeting option to create highly personalized ads. – Anniversary Within 30 Days: This option allows you to target Facebook users who will be celebrating a wedding anniversary within the next 30 days. If you run a company that sells jewelry/flowers or are a hotel or airline this could be a great targeting option for you. Please share your brand’s experiences with these targeting options, along with any other options we may have missed in the comments below.